Tesla Inc (NASDAQ: TSLA) stock was trading lower by around 1.3 percent ahead of Thursday's open. Shares traded lower by nearly 2 percent in reaction to the company's earnings report after Wednesday's close. 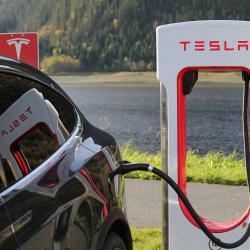 The company said it lost $3.04 per share in the fourth quarter on revenue of $3.29 billion, while Wall Street analysts were expecting Tesla to lose $3.12 per share on revenue of $3.28 billion. Twitter Inc (NYSE: TWTR) gained more than 20 percent and traded above the $30 per share level for the first time since 2015. The social media company reported a surprise beat in its fourth quarter results which also happens to be its first ever quarter of profitability. NVIDIA Corporation (NASDAQ: NVDA) gained 2 percent ahead of Thursday's opening bell. The company is scheduled to report its fourth quarter results after Thursday's close and is expected to earn $1.16 per share on revenue of $2.67 billion. GrubHub Inc (NYSE: GRUB) soared more than 20 percent after the restaurant pick-up and delivery provider announced a new partnership with Yum! Brands, Inc. (NYSE: YUM). As part of the agreement, Yum will buy $200 million worth of GrubHub's stock and the company's KFC and Taco Bell restaurants in the U.S. will be added to GrubHub's delivery platform. Infinera Corp. (NASDAQ: INFN) soared higher by more than 20 percent after the networking equipment provider reported its fourth quarter results. Infinera said it lost 12 cents in the fourth quarter on revenue of $195.8 million, while Wall Street analysts were expecting the company to lose 13 cents per share on revenue of $190.26 million. Madrigal Pharmaceuticals Inc (NASDAQ: MDGL) lost nearly 3 percent after the clinical-stage biopharmaceutical announced an update to an ongoing clinical trial. The company's therapy, MGL-3196, realized significant improvement in the reduction of LDL cholesterol compared to a placebo.